Much has been said (or misstated) about systems of academic tenure in higher education. One of the more popular narratives is that tenure as an established practice is on its way out, for better or for worse. Since AACSB International tracks the numbers of full-time faculty who are tenured, tenure-track, or non-tenure-track in the annual Business School Questionnaire (BSQ), I thought it might be instructive to examine trends over time to see if our data bear out the popular narrative. Source: Controlled set of 494 business schools that reported tenure status data to the BSQ in all five years. As you can see, the proportion of non-tenure-track full-time faculty has indeed been steadily on the rise, primarily (though not entirely) at the expense of the proportion of tenured faculty. While tenured faculty do not appear to be in any danger of losing their majority status yet, it is worth noting that these proportional patterns persist despite a 5 percent overall increase in the absolute number of full-time faculty reported by this controlled set of schools over the past five years. In fact, when looking at absolute numbers, the total numbers of full-time faculty in the tenured and tenure-track categories have each risen by only 1.5 percent over this period, while the number of non-tenure-track faculty has risen by nearly 19 percent. Source: Controlled set of 494 business schools that reported tenure status data to the BSQ in all five years. 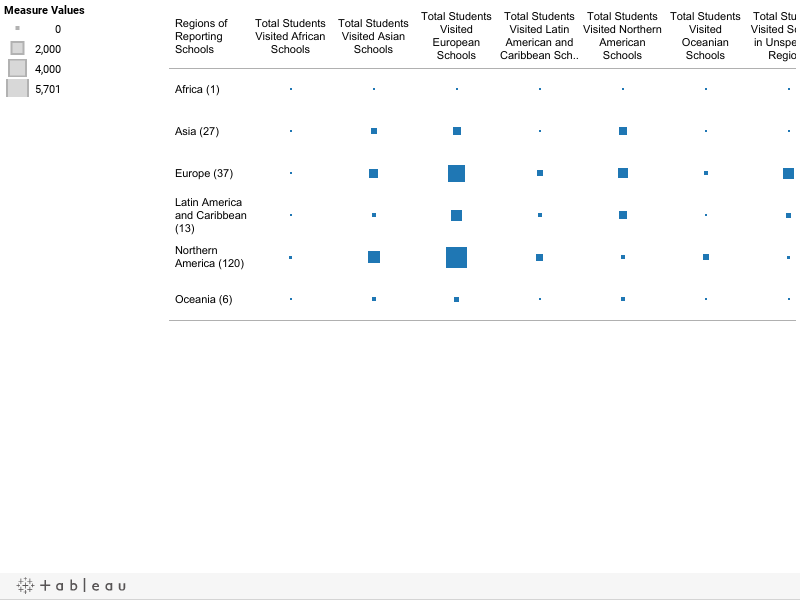 Note: The European version of the BSQ does not ask for tenure data, and there were too few schools in the set from Africa to include in Figure 2. Looking across world regions, it seems that the trend toward decreasing use of tenured or tenure-track faculty is more pronounced in some regions than in others. The reporting schools from the Middle and Near East even reverse the trend during this period, with growth in the total numbers of tenured or tenure-track faculty, and shrinkage in the number of non-tenure-track faculty. Nevertheless, for all other world regions in which tenure data are collected, growth in the total numbers of non-tenure-track faculty outpaces growth in the numbers of tenured or tenure-track faculty, often significantly. As promised in my last post, today I discuss the categorization of supporting faculty along several dimensions. Please note that the schools included constitute the same set that I looked at in my last post, but 27 of those schools reported no supporting faculty at all, and have thus been removed from the number of schools in the tables below. In contrast to the participating faculty, those who are deemed supporting faculty are more likely to be classified as Instructional Practitioners (IP) than any other qualification category defined in Standard 15. Even more so than with Scholarly Academic (SA) participating faculty, the proportion of IP-qualified supporting faculty is significantly higher in the AACSB-accredited schools; however, in this case the difference is likely due to a similarly higher proportion of supporting faculty in the non-accredited schools that have not yet been classified. This makes sense, given that those schools that have not yet attained accreditation would be less likely to have made such classification a priority. Since 60 percent of the reported supporting faculty in this set are from schools in Northern America, it is clear that the overall worldwide figures are somewhat skewed in favor of Northern American proportions, but it is still interesting to look at the relative proportions across geographic regions. Unlike with SA-qualified participating faculty, only Africa and Northern America show clear majorities of supporting faculty classified as any of the four qualification categories. While it is true that supporting faculty from schools in the other regions are classified as IP more often than not (when classified at all), it is nevertheless clear that these schools are much more likely to employ SAs or Practice Academics (PAs) as supporting faculty, as well. As with AACSB Accreditation, the program levels offered by reporting schools appear to make major and interesting differences in their proportional complement of supporting faculty qualifications. Again, supporting faculty are classified as IP more often than not, regardless of program levels offered, but only those schools that offer undergraduate programs and not doctoral programs show clear majorities of such faculty. Schools that offer doctoral programs, or that do not offer undergraduate programs, are significantly more likely to have SA and, to a lesser extent, PA supporting faculty, which makes sense given that they would need more scholarly support in order to focus on higher-level degree programs. Interestingly, schools that offer only undergraduate programs are apparently by far the most likely type of school to have PA supporting faculty. Now that the 2013 AACSB Accreditation Standards have been in place for a couple of years, a large majority of AACSB member schools are now comfortable classifying their faculty into the new qualification categories defined in Standard 15 (i.e., Scholarly Academic or SA, Scholarly Practitioners or SP, Instructional Practitioners or IP, and Practice Academics or PA). In fact, of the 770 total schools that participated in the 2014–15 Business School Questionnaire (BSQ), approximately 73 percent were able to report their faculty strength in those terms, broken out by participating versus supporting faculty. In this post, I discuss the categorization of participating faculty along several dimensions. Unsurprisingly, given the proportional requirements of Standard 15 and the relative size of the set of accredited versus non-accredited respondents to the BSQ, the SA category forms the majority of participating faculty, though the proportion is certainly higher in the AACSB-accredited schools. What I find interesting here is that the same difference in proportion of such faculty at the non-accredited respondent schools, just over 6 percent, appears to be made up by their faculty whose qualifications include a mixture of academia and professional practice (i.e., either SP or PA). Again, given the requirements of Standard 15, SA faculty are likely to form the majority of participating faculty regardless of where in the world the reporting school is located. However, it is interesting to see that there is still a high degree of variability across geographic regions in terms of how large a majority of SA faculty exists. In particular, schools in Latin America and the Caribbean, and to a slightly lesser extent in Europe, appear to be the most inclined to employ participating faculty of more diverse qualification categories. I should also note that the high proportion of SA faculty in Africa is likely due to the small number of respondents, and that all of those schools are either accredited or in the initial accreditation process. As with the other dimensions discussed above, variance in the types of degrees offered by reporting schools does not preclude the SA category’s prominence. What I find interesting here is that the schools that offer only graduate programs seem to be the most willing to hire participating faculty with more diverse qualification types. In particular, such schools show the largest proportion of SP or PA faculty, which may indicate both the necessity and freedom to include a greater emphasis on the practical knowledge at schools focused entirely on graduate-level studies. Be on the lookout for the next post in this series, in which I will take a similar look at reported qualification types in supporting faculty! In our efforts to continuously improve the level and quality of data we are able to provide, AACSB International has begun the process of modularizing our largest and most comprehensive annual survey, the Business School Questionnaire (BSQ). The goal of this process is to streamline the main BSQ, while simultaneously affording our members the opportunity to drill down in greater detail in areas of particular interest to them. Our first such spinoff, the BSQ Finances Module, was released this February concurrently with the main BSQ. The Finances Module is designed to capture more of the data and information our members have been requesting about the financial and governance models used by business schools around the world. With 346 participants, representing 26 countries and territories around the world, our initial run of the new module has been very successful in yielding robust data and new insights into these areas that have historically been lightly or even entirely unexplored. A) Standard Academic Unit of Parent Institution: The business school is one academic unit among several others, all of which are part of a larger parent university (or other academic institution) from which it derives degree-granting authority (e.g., Auckland University of Technology Business School, Universidad ICESI’s Facultad de Ciencias Administrativas y Economicas, Sauder School of Business at University of British Columbia, etc.). B) Semi-/Mostly Autonomous Unit of Parent Institution: The business school is a semi- or mostly autonomous academic unit, but still derives degree-granting authority from a larger parent university or other academic institution (e.g., HEC Montréal, Porto Business School, UCLA Anderson School of Management, etc.). C) Independent Institution: The business school is an independent academic institution with its own degree-granting authority, not attached to or dependent on any other academic institution (e.g., BI Norwegian Business School, EMLYON, Insper Instituto de Ensino e Pesquisa, etc.). Two thirds of all the schools that classified themselves as independent standalone business schools (Type C) were European. Indeed, 40 percent of all European respondents indicated that they were not Type A, which leads me to believe that a greater degree of overall autonomy is much more the norm for business schools in Europe than for their counterparts in regions like Northern America or Oceania. I will dig deeper into this issue in my next post, when I plan to drill down more into the results of some of our more detailed aspects of functional autonomy. Interestingly though, 61.5 percent of the schools that self-identified as Type B were located in Northern America. While I don’t expect that the model of more autonomous business units will become the norm in Northern America to the same degree that it is in Europe, I do think it will be interesting to watch and see if the proportion of non-Type A schools in Northern America grows over time. As you can see, larger schools have progressively greater chances of being semi- or completely autonomous. Indeed, large schools (i.e., those with over 75 full-time faculty members), are more than six times as likely to be Type C as small schools (i.e., those with 35 or fewer full-time faculty), and more than twice as likely to be Type C as medium-sized schools. As you can see, schools in some countries are demonstrating clear preferences for partnerships with institutions in certain specific other countries (and regions). For example, reporting schools in China are much more likely to partner with schools in the U.S. or other Chinese schools than they are with those in the other BRICS nations (e.g., Brazil, Russia, India, and South Africa). Indeed, American partners seem to be in high demand all over the world, as they make up approximately 16.8 percent of all named partners in the survey, the highest percentage of any nation in the world. Source: AACSB International Collaborations Survey 2012-13. What I find interesting is the wide variance in the ratios of total partnerships to number of named partners, even in this relatively small set of the most popular countries in which to find partners. What this seems to indicate is that even though the U.S. has many more total partnerships and named partners than Australia, for example, Australian partner institutions are much more likely to have a larger number of schools reporting partnerships with them. This illustrates that there are multiple dimensions to consider when we are looking at which partners are most attractive to business schools. Collaboration Activity Part I: How Globalizing Is It? In AACSB International’s Collaborations Survey, one of the most important things we track is the degree to which our participating schools are involved with partners they name from around the world. As a reminder, in this survey we define partnerships as one-to-one connections between a pair of institutions, whereas a reported collaboration may include one or many such partnerships. Further elaboration on this and other terms used can be found in the 2012-13 Collaborations Survey Overview Report, now available to all AACSB members in the Downloads area of DataDirect. 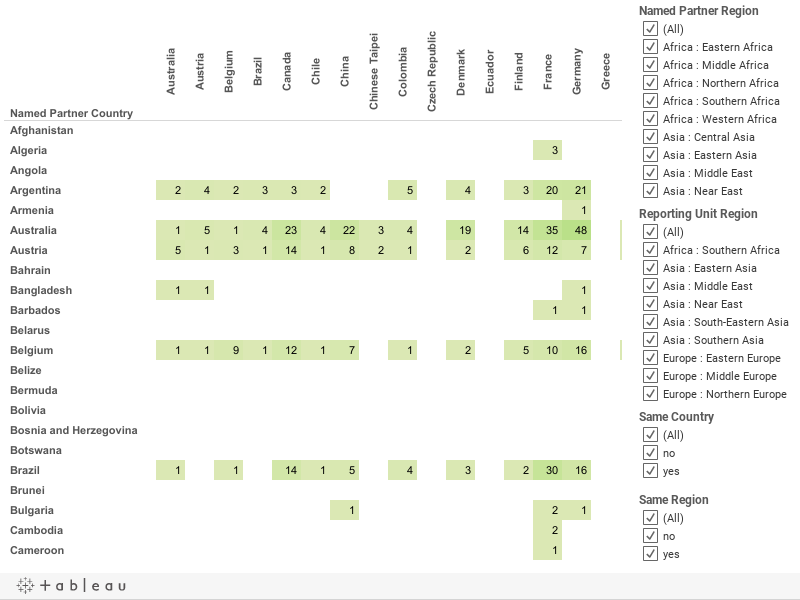 While a degree of reporting bias is inevitable in surveys of this sort, I was interested to see which areas of the world had far more partnerships than others, despite hosting far fewer reporting schools overall. This is, of course, likely due to the fact that most reported partnerships are with schools outside the country of the reporting school. Overall, only about three percent of all reported partnerships were between two institutions in the same country. Indeed, 71 percent of all the countries represented by reporting schools had no same country partnerships reported at all. Institutions in the same region are slightly more commonly paired, as about 12.3 percent of all reported partnerships were between two institutions in the same world region. Clearly then, the data from our survey indicate that business schools are developing the overwhelming majority of their partnerships with institutions in countries and regions other than their own. One conclusion that might be drawn from this is that collaborative agreements undertaken by business schools are seen as a prime means of globalizing the scope of the management education they offer. *controlled set comparison of 2008-2009 and 2012-2013 AACSB Business School Questionnaire (BSQ) data for respective regional enrollment at AACSB-accredited institutions. **"World” includes data from regions of Latin America, Oceania, and Africa, which are not reported separately due to small data set. Overall, for all AACSB accredited schools in the world, MBA enrollment has decreased minimally in the past five years, but we see quite a different story for the Specialized Master’s program with a 37 percent jump over the past five years. However, MBA enrollment still exceeds that of the Specialized Master’s – in 2012-2013 MBA enrollment across all AACSB-accredited schools was at 179,994, compared to 109,726 for Specialized Master’s enrollment. Another interesting point these data show is the difference across regions. For instance, in Asia enrollment growth for both the MBA and the Specialized MA has been relatively similar; however, within both Northern America and Europe, the growth in the Specialized MA enrollment rate has significantly exceeded that of the MBA. As the MBA becomes more established in the Asian region, as it has in parts of Northern America as well as Europe, I wonder if we will begin seeing similar trends for that region. Or, does this data suggest cultural difference and different business demands within parts of Asia, where a more “well-rounded” business knowledge is desired versus more specialized knowledge on a particular business area? What do you think? Note: This table includes data from a controlled set of 480 accredited schools that responded to the AACSB Business School Questionnaire (BSQ) in all five years. Please note that each school may have more than one fully online program at each given level. 480 AACSB-accredited schools, representing 34 countries and territories worldwide, participated in each of the last five annual BSQ surveys. Figure 1 (above) shows the numbers of these schools that reported offering one or more of their degree programs, at any level, in a fully online delivery format has grown by nearly 43% over the past five years. Obviously, much of that growth comes at the MBA level, while the gains in numbers of bachelor’s and specialized master’s programs offered fully online were more modest. One notable exception to this trend is online doctoral programs. As of this writing, no AACSB-accredited school has ever reported a fully online doctoral program on the BSQ. There are, however, AACSB-accredited schools offering blended/hybrid or distance-learning doctoral programs, so who’s to say what the future may bring? Interestingly, the regional breakdown of which schools offer their programs in the fully online format is far from even. Although schools in Northern America made up approximately 87% of the controlled set represented here, they consistently made up more than 95% of those who reported offering fully online MBA or specialist master’s programs, and 100% of those offering fully online bachelor’s programs. By contrast, there are as yet no African or Asian respondents that report fully online programs at any level, and there were none in Oceania prior to the 2010-11 survey year. This regional concentration is at least partly a function of greater historical participation in the BSQ in Northern America. However, since the regional concentration of schools offering fully online programs remains several percentage points higher than the regional concentration of BSQ participants in all years, participation is clearly not the only contributing factor. Given the origins of the Internet itself in the region, for example, schools in Northern America have also had the most time and opportunity to develop the virtual infrastructure necessary to make offering fully online programs feasible. Additionally, since fully online education makes geographical location largely a moot point from the perspective of potential students, the location of the offering institution probably matters less than it would for other modes of delivery. Now, it very well may also be that schools in regions other than Northern America are underreporting their programs, or are simply underrepresented in the BSQ thus far. The number of BSQ participants outside Northern America has grown steadily over the past five years, however, and is up 45% in 2011-12 versus 2007-08. This will be a trend worth continuing to watch, particularly as our global participation grows larger and larger.